Throughout Dan O’Brien’s play, “The Body of an American,” a writer, called Dan because he is the stage alter ego for Dan O’Brien, talks to a character representing Toronto Star war correspondent, Paul Watson, about a play he wants to write about his experiences in the world’s tensest places and, particularly, about a famous picture Paul took in Mogadishu of an American, Michael Cleveland, being dragged through the streets by a rabid mob that is tearing him to death amid other tortures. Conversation about this play goes on for 90 minutes, colored by visits to exotic and dangerous places and information about both Dan’s and Paul’s lives, their angsts and family backgrounds being the primary focus. Pregnant as “The Body of an American” is with facts and ideas that provoke thought and might spark empathy from audience members for whom a collection of random psychological red herrings are enough, O’Brien fishes yet for that play to be written about Dan’s professional entanglement with war and its images. “The Body of an American” may provide anecdotal insight into what it’s like to be the middle of pandemonium and ugliness that could prove as fatal to a reporter as it is to the soldiers and civilians he covers. It may touch, even deeply, on the emotional scars left by witnessing the worst of inhumanity on a constant and intense basis. It may also comically depict the writer’s dilemma in conquering everything from concept to procrastination. But it never graduates into a play. The stuff of drama, present though it is, eludes O’Brien and makes “The Body of an American” tedious as one waits for it to break through its veneer of poignancy, its tone of expectation and revelation, and become the searing, gut-wrenching theater O’Brien’s, and Watson’s, material has the potential to deliver when refined from its raw state. O’Brien’s work is self-conscious and incomplete. By putting himself in the center of the crisis he has while figuring out to how to dramatize Paul’s story, he betrays a neediness to grab some of the attention and the sympathy that would be more effective if he could conjure how to supply more than a surface portrait of Paul and more than a bland, “consider this” depiction of the trauma and withdrawal Paul’s years of experience at battle scenes eventually foments. “The Body of an American” has all of the ingredients it needs to be powerful and emotionally painful, but something goes awry with O’Brien’s seasoning, and the meat of his play is woefully and surprisingly undercooked so it’s robbed of flavor and doesn’t satisfy the playgoer’s need to get involved and receive some sensual reaction. O’Brien has played with language, but his words limp from the page when they need to be charged with passion that lets you not only see, but realize viscerally, to the point of sharing, Paul’s intimate acquaintance with immediate unspeakable horror. Words may be the problem. Storytelling might be too easy a mechanism for O’Brien to rely upon. It could be that O’Brien knows how to craft a narrative but is not versed in the instincts and techniques that turn a story into a play. My guess is “The Body of an American” reads pungently in script form, that the reactions and opinions Paul expresses are tough, shocking, and unnerving, and that Dan, as the bumbling slacker with the foresight to follow a story that might rescue him from a life of nomadic adjunct professorships and justify his receiving of several grants, provides charming comic relief. As I’ve noted, the virtues within “The Body of an American” reveal themselves, fairly clearly, but it’s also evident that director Michael John Garcés, so absorbingly atmospheric in his directing of last season’s “The Convert” for the Wilma, did not have the scenes to evoke genuine dramatic intensity from O’Brien’s text and that his actors, Ian Merrill Peakes as Paul and Harry Smith as Dan, did not have sufficient material to give them characters to act rather than lines to deliver. “The Body of an American’ comes off more like a series of stories told by bunkmates during a camping trip than a work that peeks into the heart of humankind, exposes its ugliest chambers, reveals the poison in the veins, and turns its focus on the soul of someone who not only saw and recorded atrocities but who came to be affected by them in a way that influenced his life and his ability to cope with the grim, the tawdry, and in significant ways, the ordinary. I used the word “pregnant” in the beginning of this review because I heard and was touched by the amazing potential in Paul’s story. Watching Peakes and Smith perform O’Brien’s play, I wasn’t touched at all. I had the reaction of a reader, or more accurately, the reaction of someone hearing a lecture on an intense topic. I understood all that was being presented, but I was never physically or emotional moved by it. I walk away enlightened and informed but not horrified, saddened, amused, or entertained on any but the most matter-of-fact level. My perception of something may have changed, but my world has not been upset or influenced. Only a rare play can accomplish that, but “The Body of an American” seemed to have the ammunition that gave it the chance to have a profound effect and squandered it. O’Brien includes some amusing passages. I laughed out loud more than once at random comments or events. As a reporter who has covered crime scenes, I knew what Paul was trying to say about the business of news and the callousness the newsperson comes to resent when he or she realizes how desensitized constant exposure to horror makes him or her. I didn’t buy all of Paul’s conclusions about his work, but I found them interesting from a character perspective and as ideas on chew on and examine. “The Body of an American” kept me busy, only not in the way I would have liked. My thinking and maundering took place during the play, as a form of remaining mentally occupied, instead of after it. I wasn’t engaged enough to postpone the entertainment I get from cogitating over what characters say and actors do. O’Brien’s play, and Garcés’s production did not rivet my attention and prevent it from wandering. I wished about two-thirds of the way through the play’s 90 minutes that it would end. Enough was said and realized to preclude the play’s need to continue. I became bored. Now, in thinking of all of the subjects O’Brien and his characters broach, I wonder how that can be. But I know it’s because nothing of drama emerged and that the thoughts and ideas hung in space to be considered in series as leisure allows. “The Body of an American” begins with Dan, the writer, e-mailing Paul, the journalist, about the picture he took in Mogadishu. He is looking to learn how Paul felt while being confronted with such a horrific event, one he had the responsibility to record in pictures and words. That meeting is for a play Dan proposes to write about reporters who cover war, using Paul as a model. We know already the play Dan writes is “The Body of an American.” The conceit of creating the play you intend by writing a play consisting of dialogue used to discuss the forming play, instead of finding the essence of Paul Watson in a more representational way, gets a tad precious. Both Dan and Paul talk openly about their ordeals, Dan trying to stay afloat as a writer by getting this play done, Paul as someone who eventually feels the sum of the ugliness he’s witnessed and has the urge, perhaps unknowing, to retreat from it. Both men speak of conflict, their separate and mutual internal conflict, but little conflict registers on stage. That’s because it’s narrated instead of dramatized. Paul and Dan, the only characters we see, have no reason to confront one another. We see them contending with inner devils, and while their angst and psychological scarring run deep, the expression of what they feel doesn’t. In the end, O’Brien gives Peakes and Smith little to play. You can see the strain of this on both actors, but especially on Peakes, who looks as if he wants to break through with some bravura revelation or epiphany but is held back, more by O’Brien and his text than by Paul and his feelings. Paul makes some bizarre political extrapolations about his famous photo and his reporting in general. He talks about the effect his work has had on his humanity and how almost defensive insensitivity to the moment — not to an event, but the moment — turns to an almost regretful sensitivity when one considers the total of what he has seen and his need to be objective about it for a time. Paul can only compartmentalize so much. The problem is “The Body of an American” is when his emotional floodgates open, the scene plays as one more insight Paul has about himself and not as a crushing statement or breakthrough that tears the audience apart with sympathy or grief. Ian Merrill Peakes is hampered by O’Brien’s writing. It limits him and his responses. Peakes is just the actor who the kind of role one can envision for Paul. He has the depth and the vocal dexterity to make this man a monument to duty that turns into regret and even paranoia. O’Brien doesn’t grant him the privilege to stun us. Because of that, Peakes often sounds more like a narrator than a character involved in the play’s action. He has some scenes in which he can toy with ancillary characters and do some shtick, but the core of Paul Watson is not written in a way for an actor to give it ferocity or to play a breakdown that drives Paul to prefer the Yukon and taking pictures of huskies to landing in another war zone. Harry Smith is luckier. O’Brien endows Dan with tics and character traits that permit Smith to grab the stage on occasion or, at least, to be jaunty and slackerish in a way that entertains. Dan’s memories of his family, the key to his psyche, have no more impact than Paul’s reflections about war. They should be poignant, but they’re not. One wonders why, though, since he knows his mother tunes in to his blog once or twice every day, he doesn’t take that as a sign she cares about him and call her. I guess that’s O’Brien trying to be tough and to negate family, as “The Body of an American” constantly does. Until that is, you get to Michael Cleveland’s family, one that is not interested in helping Paul or Dan deal with their angst. Smith is excellent at playing Cleveland’s brother and in expressing his point of view. I’d like to see O’Brien return to the drawing board, grant in hand of course, and rethink “The Body of an American” as a less narrated and more enacted work. So much is loaded in the dialogue, and so little registers dramatically as more than interesting conversation, almost as if we are hearing the e-mails Dan and Paul exchange rather than living their inherent emotion. Interesting enough, I met a war photographer in New Orleans. He was a waiter at the place on Royale where I had breakfast most mornings, a sleepy joint from which you could see the ramshackle balconies and listless jacarandas of NOLA. I was his first customer ever, and he was dreadful as a waiter. But I gave him advice from my experience from the days before I traded the “a” in waiter for the “r” in writer, and tipped him $10 for encouragement. The tip was more than the bill. Two days later, I met the guy, a New Zealander in a bar. We had some things in common, both being NZs, both being gay, and both being in the news business. He told me about his experiences in Iraq and enacted the moves he had to make to get salable pictures while avoiding being shot. We all know, after all, how impervious the press feels towards danger. Like Paul, he needed to escape from his job on the battlefield. He came to New Orleans the way Paul heads to the Arctic to be somewhere that war, as he knows it anyhow, is not taking place. He needed to forget what he’d seen and be a waiter and a wastrel of sorts for a time. Like a Tennessee Williams romantic, he saw himself drowning haunting memories in menial labor, nights of carousing, and kisses and more when the opportunity arose. He was a wonderful kisser. A memorable kisser. I thought of my New Zealander several times while watching “The Body of an American,” especially as I remembered the comic zeal and literal acrobatics with which he played out the war photographer’s role. My friend was being funny, but he was also enmeshed in his enactment and got fiercely wrapped up in it. You can see the emotion he came to New Orleans to escape returning to him as he described bodies and rubble and frightened children. That mime on a vacant Rampart Street lot was more touching and immediate than anything I saw at the Wilma. And that is the waste of what O’Brien had to mine. “The Body of an American” runs through Sunday, February 1, at the Wilma Theatre, Broad and Spruce Streets, in Philadelphia. Showtimes are 6:30 p.m. Tuesday, 7:30 p.m. Wednesday, Thursday, and Sunday, 8 p.m. Friday and Saturday, and 2 p.m. Saturday and Sunday. A 2 p.m. matinee is set for Wednesday, Jan. 28. No 7:30 performance is set for Sunday, Feb. 1. Because of wonderful grant from the Wyncote Foundation, all tickets at the Wilma this season are $25 and can be obtained by calling 215-546-7824 or by visiting www.wilmatheater.org. 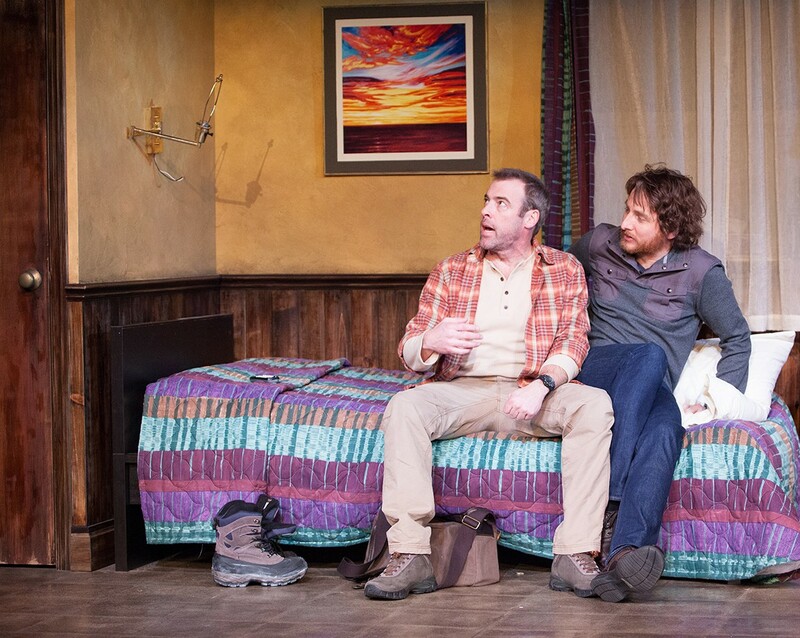 This entry was posted on January 16, 2015 by nzoren in Theater Reviews and tagged Biography, Dan O'Brien, drama, Harry Smith, Ian Merrill Peakes, Michael John Garces, Paul Watson, Philadelphia Theater, War, Wilma Theater.